The article shows the discrete nature of the plants ceonomorphes on an example of flora of the southeast of Ukraine. Using discriminant analysis shows that ceonomorphes are discrete classes of plant species which are isolated between themselves to a greater extent than it can be assumed on the basis of only the continuum nature of the ecological differences between species. The predictors used in the discriminant analysis are diapason Didukh’s phytoindicator scales and rescaled Ellenberg scales. The high level of discrimination ability of the model built on the basis of continual predictors shows a considerable species specificity within individual ceonomorphes. The ecomorphic analysis of the ceonomorphes is presented. The aridants as a new ceonomorph is proposed. The reason of the the ceonomorphes compact configuration is a coadaptation of the plant species within each ceonomorphes, as well as in the transforming influence on the environment of the plant community. Using the method of tree classification the rules for the ceonomorphes identification are searched based on the allocation ceonomorphes within phytoindication scales. Phytoindication scales suggested to consider as biotope markers and ceonomorphes suggested to consider as ecotope markers. Apostolov, L. G. (1981). Pest entomofauna of the forest biocenosis of Central Dnieper. Kyiv: Vyshcha Shkola (in Russian). Baranovskiy, B. А. (2017). Differentiation of new coenomorph in context of the Belgard’s ecomorph system development. Ecology and Noospherology, 28 (1–2), 28–35. Baranovskiy, B. O., Manyuk, V. V., Іvanko, I. A., Karmizova, L. O. (2017). Flora analysis of the national natural park "Orіlskij". Dnipro: Lіra, (in Ukranian). Barsov, V.A. (2001). 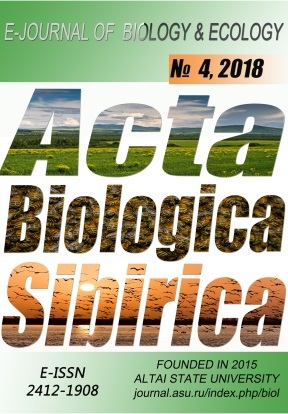 Assessment of the current state of the Papilionoidea butterflies of the Dnieper-Orilsky Reserve. Reserve business in Ukraine, 7 (1), 39-43. Belgard, A.L., (1950). Forest vegetation of South–Eeast part of the USSR. Kiev: Kiev State University (in Russian). Clifford, N. J., Harmar, O. P., Harvey, G. & Petts G. E. (2006). Physical habitat, eco- hydraulics and river design: a review and re- evaluation of some popular concepts and methods. Aquatic Conservation: Marine and Freshwater Ecosystems, 16, 389–408. Dahl, F. (1908). Grundsaetze und grundbegriffe der biocoenotischen forshung. Zoologischer Anzeiger, 33, 349–353. Didukh, Ya.P. (2011). The ecological scales for the species of Ukrainian flora and their use in synphytoindication. Kyiv: Phytosociocentre. Drogunova, M.S., Nazarenko, N.N. (2017). Coenomorphs of Tambov province flora and biotopes’ phytoindication. Tambov University Reports. Series: Natural and Technical Sciences, 22 (5), 780-786. DOI: 10.20310/1810-0198-2017-22-5-780-786 (In Russian, Abstr. in Engl.). Ellenberg, H., (1979). Zeigerwerte der Gefisspflanzen Mitteleuropas. 2nd ed. Scripta Geobotanica, 9, G6ttingen, 122. Ellenberg, H., Weber, H.E., Dull, R., Wirth, V., Werner, W., Paulissen, D. (1992). Zeigerwerte von Pflanzen in Mitteleuropa. Scripta Geobotanica, 18. Fedorov, L.V., Kupatadze, G.A., Kuranova, N.G., Viktorov, V.P. (2017). Classification of urban edafotops in connection with the study of sinantropy (for example, the town of Orekhovo-Zuevo). Socio-environmental technology, 1, 52–64 (in Russian). Hubbell, S. P. (2005). Neutral theory in community ecology and the hypothesis of functional equivalence. Functional Ecology, 19, 166–172. Jowett, I. G. (1993). A method for objectively identifying pool, run, and riffle habitats from physical measurements. New Zealand Journal of Marine and Freshwater Research, 27, 241–248. Karatzoglou, A. (2004). Kernlab – An S4 Package for Kernel Methods in R. A. Karatzoglou, A. Smola, K. Hornik, A. Zeileis. Journal of Statistical Software, 11(9), 1–20. Kunah, O. N., Prokopenko, E. V., Zhukov, A. V. (2014). Ecomorphic organisation of the ukraine steppe zone spider community. Gruntoznavstvo, 15(1–2), 101–119 (in Russian). Matveyev, N. M. (2001). Quantitative estimates of ecomorphic composition of plantations in the steppe zone. The problems of the sustainability of forest ecosystems. Ulyanovsk: Ulyanovsk University Press, 118-122 (in Russian). Matveyev, N. M. (2003). The optimization of the Belgard plants ecomorphes system ecotop and biotop phytoindication. Visnyk of Dnipropetrovsk University. Biology, ecology, 2 (11), 105–113 (in Russian). Möbius, K. (2000). The Oyster bank is a biocönose, or a social community. In D. R. Keller & F. B. Golley (Eds. ), The Phylosophy of ecology(From science to synthesis, pp. 111–114). Athens, Georgia, USA: University of Georgia Press. Naveh, Z. & Lieberman A.S. (1994). Landscape Ecology: Theory and application, 2nd edn. Springer-Verlag. New York. Nazarenko, N.N. (2016). Coenomorphs of south Ural steppe flora (basing on the example of Chelyabinsk region). Tambov University Reports. Series: Natural and Technical Sciences, 21 (5), 1889–1896. DOI: 10.20310/1810-0198-2016-21-5-1889-1896 (In Russian, Abstr. in Engl.). Nazarenko, N. N., Didur, O. A. (2012). Cenomorphes of the natural deciduous forests of the Northern steppes of Ukraine. Visnyk of Dnipropetrovsk University. Biology, ecology, 20 (1), 66–77 (in Russian). Newson, M. D. & Newson C. L. (2000). Geomorphology, ecology and river channel habitat: mesoscale approaches to basin- scale challenges. Progress in Physical Geography, 24, 195–217. Padmore, C. L. (1998). The role of physical biotopes in determining the conservation status and flow requirements of British rivers. Aquatic Ecosystem Health & Management, 1, 25–35. Ramenskiy, L.G., Tsatsenkin, I.A., Chizhikov, O.N., Antipin, N.A. (1956). Ecological evaluation of the fodder lands by vegetation cover. Moscow. Sel'khozgiz (in Russian). Ramensky, L. G. (1938). Introduction to integrated soil-geobotanical study lands. Gosudarstvennoe izdatelstvo kolkhoz and sovkhoznaya literature "Selhozgiz" (in Russian). Shennikov, A. P. (1941). Meadow-Science. Leningrad (in Russian). Sørensen, T. (1936). Some ecosystemtical characteristics determined by Raunkiær's circling method. In "To designate the fundamental unit of ecological plant sociology I propose the term ecotope, viz. the field delimited as an object of investigation within a given ecosystem (Tansley)". Nordiska (19. skandinaviska) naturforskarmöteti Helsingfors den 11-15 Augusti 1936, 474-475. Sukachev, V. N. (1942). The idea of the development in phitocenology. Soviet Botany, 1–3, 5–17 (in Russian). Sukachev, V. N. (1965). Major contemporary issues of the biocenology. Biology Bulletin, 26 (3), 249–260 (in Russian). Tansley, A.G. (1939). The British Isles and their vegetation. Cambridge University Press. Tarasov, V.V., (2012). Dnipropetrovsk an Zaporozhie regions flora. Second ed. Lira, Dnipropetrovsk (in Ukranian). Townsend, C. R., & Hildrew A. G. (1994). Species traits in relation to a habitat templet for river systems. Freshwater Biology, 31, 265–275. Tsyganov, D.N. (1983). Phytoindication of ecological factors in the subzone of mixed coniferous–broad–leafed forests. Moscow: Nauka (in Russian). Vysotsky, G. N. (1925). Cover science. Minsk, Leningrad: Main Botanical Garden (in Russian). Zhirkov, I.A. (2017). Bio-Geography, general and specialty. Moscow: KMK Scientific Press (in Russian). Zhukov, A.V, Zadorozhnaya, G.A. (2016). Ecomorphes of the sod-lithogenic soils on reddish-brown clays. Issues of steppe forestry and forest eclamation of soils, 45, 91–103. Zhukov, O. V., (2009). The ecomorphic analysis of the soil animals consortia. Dnipropetrovsk: Svidler press (in Ukranian).